ONAP, OPNFV and ODL are critical components of Orange’s next generation SDN/NFV initiatives to enable 5G, big data, AI and IoT network services. Orange is a leading telecommunications company with headquarters in France. It boasts 273M customers worldwide, 152,000 employees and a revenue of €41B (2017). Their solutions range across mobile, fixed telephony, internet and IPTV. Orange has wireless deployments in 13 countries, 46 million 4G customers across the Group, over 4.7M fibre customers and 450,000 km of undersea cable. The company also offers business solutions and networks, carrier services, and a variety of related telecommunications products and services. They are the largest telecoms operator in France, with the bulk of their operations in Europe, Africa and the Middle East. Orange has an ambitious, forward-looking strategy fueled by research and innovation. “Better me“: Technology should help us to cultivate everybody’s potential whilst at the same time guarantee our autonomy and empower us to maintain control over our lives. It should be as widely accessible as possible and allow us to curate and protect everyone’s digital capital. “Smarter society“: Digital technology should be a great opportunity to build a more intelligent, more responsible and inclusive society, thus enabling the emergence of new trade methods and new social or business contracts. “Augmented planet“: Innovation should contribute to an increasingly connected planet but also one that is more balanced, a planet that is made more intelligent by technology, all the while working to preserve increasingly scarce natural resources. Orange has announced 5G trials in France for 2018 and aims to deliver an operational 5G network by 2020. To do so requires the use of new SDN and NFV technologies to improve agility and reduce costs. The SDN/NFV programme is aptly named “On-Demand Networks”. For Emmanuel Lugagne Delpon, SVP Orange Labs Networks, “The ONAP project is a unique opportunity for our industry to make SNF/NFV ecosystem scale while avoiding its fragmentation”. As a result, 5G will be natively virtualised using containers and virtual machines. In addition to just being a technology transformation, SDN/NFV requires a cultural transformation as well. “On-Demand Networks will profoundly impact our ‘factory’ (i.e. network) and business models along with changing consumer usage and create a huge societal impact,” says Jehanne Savi, Executive Leader of the All-IP and On-demand Networks Programme at Orange. Orange’s first commercial On-Demand Network offering was the Easy Go Network in 2016. 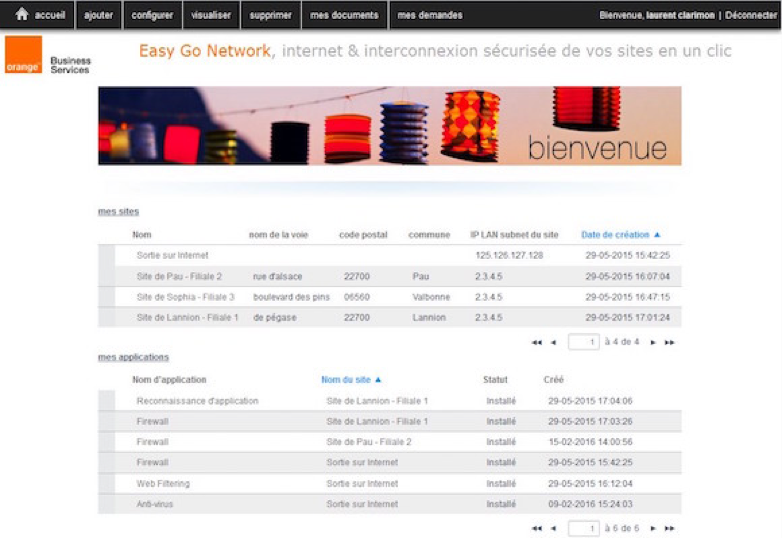 Provided by Orange Business Services, the Easy Go Network helps companies instantly provision branch connectivity by deploying virtual network functions (VNFs) on a universal customer premise equipment (uCPE) device. Ordering, customer care and reporting functions are all handled through a portal. Based on Easy Go and experiences from a number of On-Demand Network trials in 2017, Orange believes that to experience the full benefit of SDN/NFV, they will need to deploy open interoperable solutions and build capabilities to deal with the rapid evolution of software solutions. Proprietary solutions create lock in, VNFs based on proprietary models require custom integrations, and user organisations have little to no ability to influence the product roadmap. The ideal solution needs to simplify network service onboarding, be able to absorb the high velocity of software changes and simplify network operations. Orange views open source software as a viable option for the NFV infrastructure (NFVI), Virtualised Infrastructure Manager (VIM), SDN controller and the Management and Orchestration (MANO) software components. With that in mind, Orange has chosen to be a platinum member of LFN and to use three key projects to drive its On-Demand Network transformation efforts — ONAP, OPNFV and ODL. Let us review each of the three projects and Orange’s participation in them. The Open Network Automation Platform (ONAP) project provides a comprehensive platform for real-time, policy-driven orchestration and automation of physical and virtual network functions. ONAP will enable software, network, IT and cloud providers, and developers to rapidly automate new services and support complete lifecycle management. With its model-driven architecture, closed-loop automation and big data analytics capabilities, ONAP presents a powerful platform to manage both SDN (for pure connectivity) and NFV services. Orange is evaluating many different use cases for ONAP, ranging from automating complex connectivity services (e.g. IP MPLS diversity paths) to SD-WAN. An initial Proof of Concept using the MEF inter-operator Ethernet services connectivity has been launched successfully. Additionally, Orange is evaluating how to manage and operate every core network VNF being introduced into its networks. The end goal with ONAP is to automate the VNF lifecycle (e.g. scale-out, self-heal, change management, upgrade) and reduce manual errors. The initial focus has been around a commercial vMRF VNF integration. With ONAP, VNF onboarding and network service deployment has been slashed to just minutes instead of weeks with physical network functions. vMRF has also been integrated with the DCAE (Data Collection, Analytics and Events) and inventory management components of ONAP to enable complex closed loops over time. Given the importance of ONAP, Orange has dedicated 20+ contributors from the inception of the project with 17 being committers. The participation has been across most sub-committees (e.g. architecture, security etc.) and various projects (e.g. Documentation, Integration, ONAP Operations Manager — OOM, External API, VNF SDK, VNF Validation etc.) Moreover, Orange has provided an ONAP open Lab, based on the Amsterdam release, to the community for learning and development based on two underlying cloud deployment technologies (OpenStack using Heat and Kubernetes using OOM). The Open Platform for NFV (OPNFV) project facilitates the development and evolution of NFV components across various open source ecosystems. Through system level integration, deployment and testing, OPNFV creates a reference NFV platform to accelerate the transformation of enterprise and service provider networks. 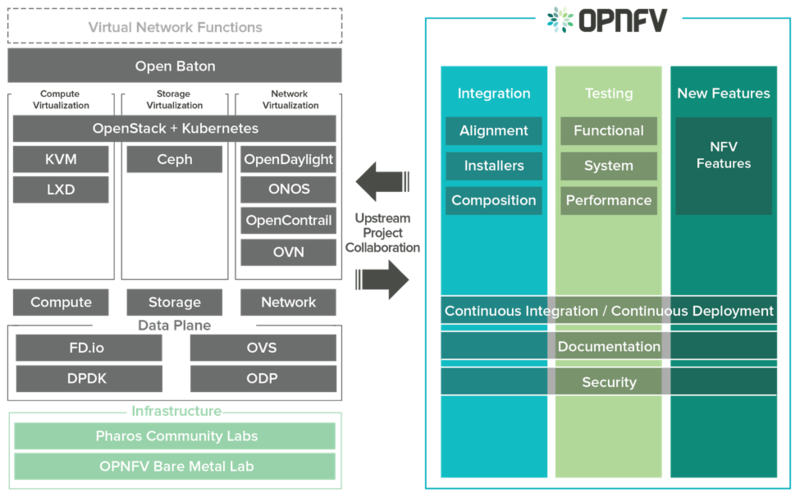 The continuous integration (CI) pipeline, complex testing tools and tuned reference architectures are some of the key contributions of OPNFV. Functest: This project deals with the tooling and test cases around validation and functional testing of various OPNFV reference architecture stacks (also called scenarios). The test suites in Functest come from upstream projects (e.g. OpenStack, ODL), OPNFV feature projects (e.g. Doctor) and the Functest team itself. The project technical lead (PTL) for Functest is from Orange and one of Orange’s key contributions to Functest has been the integration Clearwater open source vIMS VNF with the purpose of creating a realistic load on the NFVI/VIM layer. CI pipeline: OPNFV uses a very sophisticated CI pipeline that performs health checks upon every commit, integrates various projects into scenarios on a regular basis and executes daily and weekly tests automatically against those scenarios. The OPNFV CI pipeline can form the basis of a communications service provider’s (CSP) internal CI pipeline as they move into the DevOps model world. More recently Orange has been involved in an initiative called Cross Community Continuous Integration or XCI. Instead of waiting for the latest stable release, XCI regularly integrates the latest code from select upstream projects such as OpenDaylight, OpenStack and FD.io into OPNFV, slashing the time to implement new features and address bugs from months to days. Through its involvement with OPNFV, the Orange team is leveraging their experience from OPNFV to bring CI and testing methodologies across the company and to other projects such as ONAP. OPNFV is helping Orange accelerate the speed and reduce the effort to achieve network transformation both on a technical and soft skills level. “Orange sees OPNFV as the right vehicle to create an end-to-end network made of certified VNFs, NFVI reference architecture and integrated MANO,” says Savi. 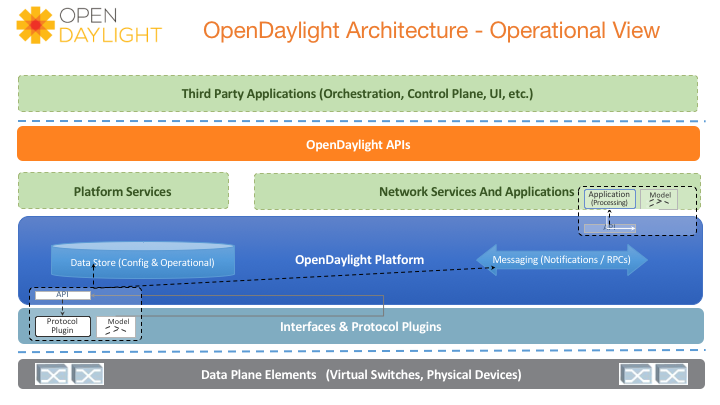 The OpenDaylight (ODL) project is a modular open platform for customizing and automating networks of any size and scale. The ODL Project arose out of the SDN movement, with a clear focus on network programmability. It was designed from the outset as a foundation for commercial solutions that address a variety of use cases in existing network environments. Orange views an SDN controller as a central component of their network transformation. An SDN controller can provide network connectivity automation and real time control for multilayer (L1/L2/L3) and multi-domain networks (datacenter, access and core). Specifically, Orange is utilising the northbound interface of ODL based on YANG models and several different types of southbound interfaces to control L1, L2 and L3 networks. There is particular interest in controlling and managing the transport network (L1) e.g. OPEN Reconfigurable Optical Add/Drop Multiplexers (OpenROADM). The team has launched Proofs of Concept for setting up an optical path (alien wavelength) between OpenROADM implementations and transponders from different manufacturers. ODL has also been used to manage multilayer interactions and to create IP MPLS diversity paths. Since ONAP SDN controller (SDN-C) is also based on ODL, Orange is evaluating the ONAP SDN-C component as well. Given the interest in managing L1 networks, Orange is leading the extension to cover transport layer L1 (Transport PCE project) and is also contributing to the BGP PCE project. Orange is also involved in the Open Compute Project (OCP) and Telecom Infra Project (TIP) that develop open source hardware datacentre and telecommunications server, network and storage hardware. Orange is evaluating the use of OCP hardware for NFV infrastructure and also contributing to the datacentre high-voltage feeding initiative. The results of participating in these three LFN projects — ONAP, OPNFV and ODL — have yielded many hard and soft benefits. Network automation: The combination of ONAP orchestration, DCAE and ODL Network Controller is enabling full SDN/NFV automation along with simplified operations and closed loop automation. NFVI &VIM testing: The Orange Integration Centre (OIC) put together an OpenStack-based solution using OPNFV test projects to validate their architecture. See the OPNFV Summit 2017 presentation for more on the use of OPNFV by OIC. VNF onboarding and certification: The global supply chain of VNF vendors simply cannot customise their offerings to cater to every CSP’s architecture. The requirements are too diverse to make this viable. ONAP combined with OPNFV can become the de facto platform for VNF onboarding and validation. This will create a virtuous cycle — as more VNF vendors test their products against LFN projects, more CSPs will join adopt them, attracting even more VNF vendors. Network design onboarding: An extension of VNF onboarding is to design and test an entire service composed of multiple VNFs. ONAP can be the de facto platform for this important role for a CSP as well. Reference NFV Infrastructure Architectures: OPNFV brings with it tuned and tested reference NFV Infrastructure that a CSP can implement using pure open source or commercial vendors. Interoperability: “No one vendor can manage the cost of interoperability testing, it must be a collective effort,” Savi says. The various test projects in ONAP, OPNFV and ODL are extremely beneficial in establishing interoperability between different open source components and between open source software and VNFs. A collaborative industry ecosystem makes interoperability testing sustainable over the long-term. Culture change: Software-based solutions are evolving rapidly and require changes to existing processes and tools. Deploying and maintaining CI and automation tools requires new skills and the development of ‘software culture’ in the network teams. As LFN projects already imbibe the culture, best practices and tooling of a modern software project, Orange sees involvement in LFN as a way to accelerate their software culture transformation. Hardening: Open source software is a way to speed up the industrialisation (hardening) of technology given the ability to make changes and to access the most current code, all in a transparent fashion. Time-to-market: The speed of innovation in an open Source software project typically exceeds that of a proprietary product. For this reason, LFN is an important vector of growth and innovation and can accelerate Orange’s time-to-market. Minimize vendor lock-in: LFN projects minimise vendor lock-in through open APIs and a vibrant ecosystem that allows CSPs to support their efforts internally or through multiple vendors. In addition, these projects can guarantee Orange’s software independence from a particular proprietary approach or product roadmap. SDN and NFV are company-wide initiatives for Orange that are deemed critical for the next generation of networks (such as 5G) and related services. SDN/NFV transformation brings a variety of challenges with it and Orange uses LFN projects to solve a number of important issues ranging from automation, design and onboarding, reference architectures, simplifying operations and interoperability testing.